Want to Know How “MELFA SafePlus” Enables Robots and Humans to Collaborate? Article provided by Mitsubishi Electric. 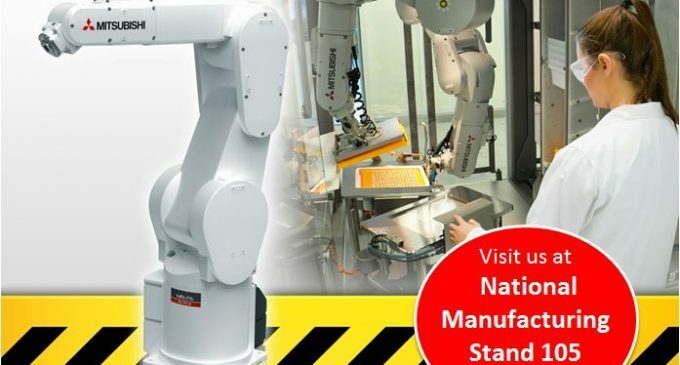 Mitsubishi Electric has developed a new optional Safety Solution “MELFA SafePlus” for its MELFA F Series industrial robots and will be demonstrating this solution at Stand 105 at this month’s National Manufacturing Conference in Citywest. The new technology limits the speed, range of movement or torque of the robot when safety sensors are activated, allowing operators to work in close proximity to a moving robot. In today’s flexible production environments, robots and human operators increasingly work side by side. Mitsubishi Electric’s integrated Safety Solution helps manufacturers to boost productivity and lift human-machine collaboration to a new level by allowing the robot to continue operation, within tight constraints, while operators access its work cell. The scanner technology detects movements in two predefined zones within the operating environment of the industrial robot and transmits the information to the MELFA SafePlus safety system. A predefined reduced operating speed or a movement stop is then assigned to the robot in real time, thus enabling operators to work in close proximity to the moving industrial robot without a safety cage. As a result, humans and robots are able to work within an environment where the risk of danger is significantly reduced. If the scanner registers a person within either of the two predefined safety zones, the robot’s F series controller switches to safety mode automatically. Speed reduction limits the maximum speed of the robot, allowing the device to carry on working at a safe speed, or stops all movement if required. Besides speed reduction, the MELFA SafePlus system has two further safety mechanisms. Limited Range Control prevents the robot from entering the part of the work cell accessed by the operator. The system monitors the position of four points on the robot arm and prevents any one of them from passing a pre-defined plane while the safety system is activated. Torque Monitoring controls the speed and movement of the robot to keep estimated torque in its joints below a pre-determined level. Actual torque in the joints is continually monitored and the robot is immediately stopped if torque exceeds the pre-set level. This ensures that the robot will stop safely in the event of a collision. In addition, all F Series robots are equipped with Safe Torque Off and Safe Stop capabilities, ensuring that motor power shuts off and the robot stops when an error occurs. This almost entirely avoids the risk of collisions with peripheral devices and other components. All new safety functions can be triggered by dual channel safety inputs and can also be easily and safely integrated into a safety system which is controlled by safety PLC. The new Safety Solution for F Series hardware and software is developed and certified to a full range of relevant safety standards, including EN ISO 10218-1 (Industrial robots), EN ISO 13849-1 (Safety of machinery), EN62061 / IEC61508 (Functional Safety) and EN61800-5-2 (Safety function Drive) . For more information visit Mitsubishi Electric at Stand 105 at the National Manufacturing Exhibition, or contact Mitsubishi Electric at: Tel: 00353 1 4198800, email: sales.info@meir.mee.com or visit:ie3a.mitsubishielectric.com.